I had no clue what it was, but I was pretty sure it was related to whatever was eating my plants. I was thinking it was eggs of the offending bugs. I snapped a few pictures and posted it to a local organic gardening group to see what it could be and then scoured Google Images. 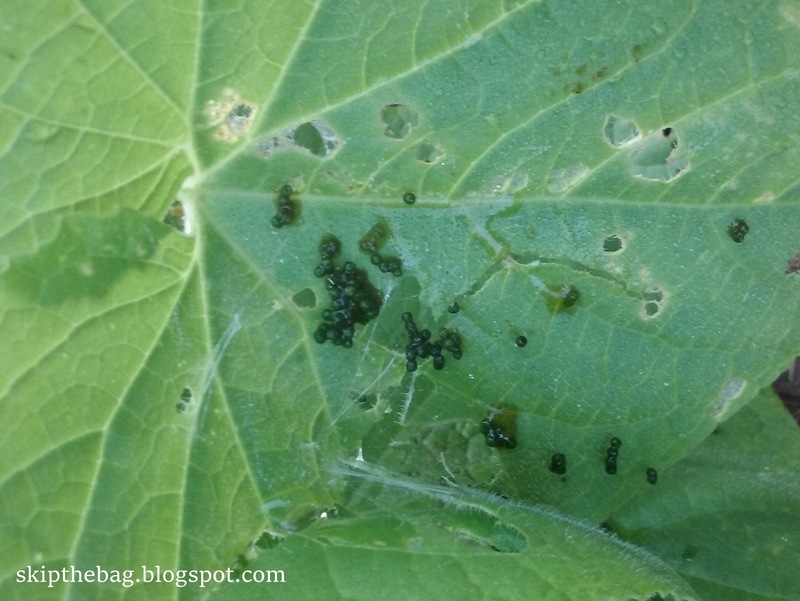 We have been dealing with leaf footed stink bugs (what I did with them), and it looked a little similar to their eggs. So I was afraid in a few days our whole garden would be covered in stink bugs. Thankfully someone from the organic gardening group got back to me quickly and said they thought it was caterpillar poop. Caterpillar poop?!? I was relieved. I could deal with caterpillars. I would just pluck them off and feed them to the chickens. There would only be a few of them to deal with unlike the hundreds of stink bugs I had fears of. I wasn't sure I completely believed her though. I mean, do caterpillars actually poop? I've never seen caterpillar poop before and these green spherical things sort of look like eggs. So I went out in search of the caterpillars that I was hoping it would be. I walk out to an area where there were some of the green spheres and looked at the back of the leaf and didn't see anything. Then I figured if it was feces it may have dropped from above so I flip over the leaf above it and BINGO! I found a caterpillar. Phew! It was caterpillar poop! I thanked the woman profusely for helping me out. I grabbed some tongs and a bowl of water and pulled those two caterpillars off the vine. Then I moved to another area where I had seen some of the green spheres. There was another caterpillar and some smaller ones. I pulled those off and put them in bowl. 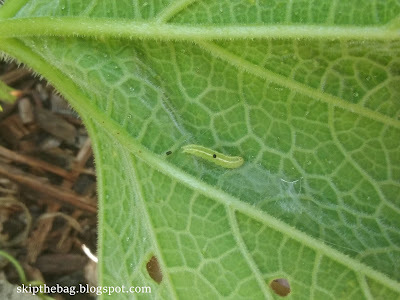 I decided to check the leaf next to it and discovered even more caterpillars of varying size. I quickly realized that I didn't need to worry about stink bugs taking over, because the caterpillars already had! Nearly every leaf had a caterpillar in some stage of development. Some were itty bitty, smaller than a nail clipping. Some were an inch long and a centimeter wide. Others were already in their cocoons. I went leaf by leaf trying to get each one I could find and dunk it in the water. Then when I was done I fed them to the chickens. I'll admit I mostly only got them in the area where the new cucumbers were planted. There are some on a squash plant we have, but since the squash isn't producing I decided to leave them for now. I know that's a big mistake, because it will only mean more to pick off later, but it's so hot! I also learned about Bacillus thuregensis (Bt). Bt is a bacteria which is naturally occurring in the gut of caterpillars. The bacteria produces an endotoxin that leads to death. can be used to which is a toxin which should work on all soft-bodied insects. You have to apply it late in the day because sun degrades it and it is washed away by rain. We are considering adding it to our garden, but wouldn't you know we are expecting heavy rainfall for at least a week! At this point it is a decision between pulling out the squash, which isn't really producing, and pulling out the cucumber since they have the brunt of the cucumber or applying Bt and try to salvage the cucumber. 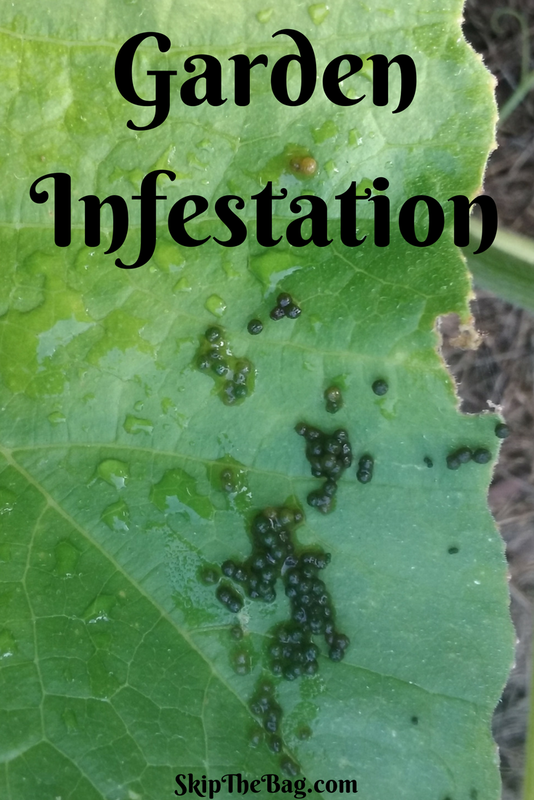 Have you ever had to pull a plant due to an infestation? Affiliate link, see privacy and disclosures. I've never pulled a plant yet -but I've never had that much of a problem before. So Bt is a organic method of getting rid of them? Hopefully you will find a solution soon. You are lucky! We ended up pulling the cucumbers out too. :( Bt is an organic treatment with a surprisingly small collateral damage. It doesn't affect humans, the plants or many other bugs. Yup - bean plants because of spider mites! We grow as organically as possible, so when I saw the infestation (too far along for a simple dish soap spray to take care of) we pulled up all the bean plants to save the rest of the garden, and it worked. In hindsight, it was my own fault because I wasn't paying attention to the little tale-tale signs until it was too late. Ah well, lesson learned! I read a great article on pest control yesterday, and now I have made up mind to use organic ways of keeping bugs and insects at bay.